Please excuse the poor quality of this photo but I can't find my camera charger so I had to take this picture with my phone. 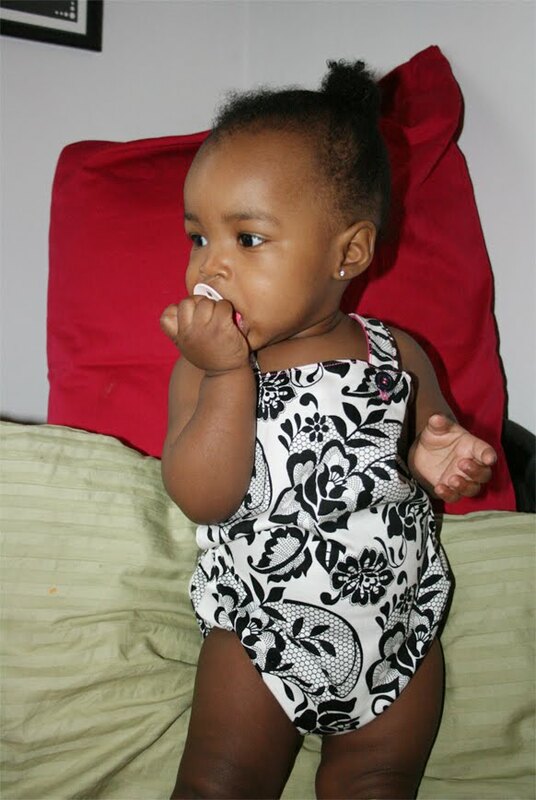 Size: It came with 12months - 5T. I made the 12months. Skill level: I would say it was beginner/intermediate level. Was the pattern easy to follow: It was extremely easy. I am pleased to say the organization of the pdf was superb. One thing in particular that I was pleased about was the page in the pdf that showed you how to piece together the pattern once you print it. It made things very easy. Did you make any alterations to the pattern: Yes! The original pattern has a bow tie closure on the outside of the coat. 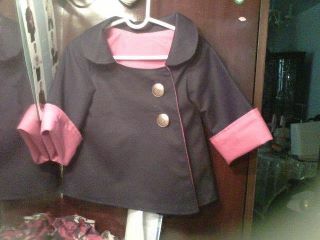 As much as I love bows I thought two big buttons would be neater, cuter and more practical for my 13 month old. What fabric did you use: I used a black medium weight slightly stretchy cotton fabric for the outer and a pink cotton for the lining. Did your finished product look like the original design: For the most part yes! The only difference was I didn't add the bow tie closure. What did you dislike about the pattern: My only complaint would be that it's too big for my daughter. The arms are quite long. But it looks pretty stylish with the arms rolled up anyway. Would you make this again: Of course! I've been searching my house looking for more fabric to make another one. I have always been a lover of hats and jackets. These are two things that has been on my sewing to-do list for years...even before I knew how to sew. Today I made my first step to getting it done and I ordered a jacket pattern from Heidi and Finn. I'm not even sure if I have enough fabric but at least I will always have the pattern around. I'm excited to make a jacket for Kelis. I think this might be my biggest project yet. I'll do my darndest to keep this blog updated with my progress. I've been teaching Kelis sign language. She knows "more", "food", "all done" and "kiss". Here's the cutest little video of her signing. Here is a how to video on one of the decorations that I plan on using for my daughter's first birthday shindig - pomander aka kissing ball. I used the colors of Foofa from Yo Gabba Gabba. I am pretty pleased with the outcome. With Kelis' first birthday quickly approaching I've been thinking of something I can do for her birthday. I decided I won't throw her a birthday party considering she'll probably just sleep right through it. I would like to take her to sesame place and invite one or two other families. I'm not sure yet but I do know that I want to take nice photos of her. Rather than having her wear a birthday hat, I was thinking about making mini top hats. I did a quick Google search and found some absolutely fantastic hats for sale. Before I purchased any I wanted to see if I could make them myself (I would make everything myself if I could). I whipped this silly hat up in about 5 minutes, literally. I used some scrap fabric, paper, Elmers glue and a random headband that I bought for Kelis months ago. I did not try to be neat at all. I just wanted to see if it was something that I should go out and purchase supplies to make or if I should simply purchase ready made ones. It definitely wasn't hard to make but I'm still not convinced that I want to purchase all of the supplies for the style of hat that I have in mind. Those were the best photos I could get at the time. She was just not in the photo taking mood. One thing that I plan on changing about the romper is the height of the back shorts. 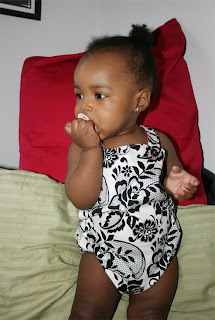 I want it to be about an inch higher because sometimes the top of her pamper shows. If anyone is interested in seeing a post about the pattern please comment and let me know. I'll be happy to share. Kelis has been doing all sorts of awesome things. She's pulling herself up by using any stable object in her path. She's walking and holding onto things. Her two bottom teeth is finally out! She's giving kisses (I just love her kisses). Those are all I can recall right now but I'm sure I'm missing stuff.